Already own a home in the Moloki Village subdivision? Thinking of selling? Click here and read about current search trends & our web network. Moloki Village homes for sale in Fairhope, AL are listed on this page and along with current Moloki Village listings is a Google interactive map, pictures, property details and other useful info for homes for sale in Moloki Village in Fairhope. 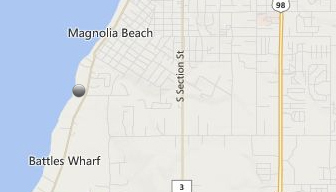 The subdivision is located in between the Magnolia Beach and Battles Wharf areas and about 1.5 miles from downtown Fairhope. Just South of Moloki Village is Lakewood Country Club which was recently purchased and renovated and is now part of the Robert Trent Jones golf trail. The homes in Moloki Village are pproximately 35 minutes from the beautiful beaches of the Alabama Gulf Coast with Gulf Shores being the closest. Moloki Village is surrounded by great restaurants, unique shopping boutiques and entertainment venues. Fairhope is consistently voted as one of the best small cities in America and has a wonderful atmosphere, great school systems and sits along Mobile Bay; one of only two places in the world to have jubilees. A jubilee is a phenomena that happens sporadically and is the result of the oxygen in the bay getting too low. Fish and shellfish literally beach themselves and are there for the taking. This is an amazing occurrence and for those who enjoy seafood, it's like going to the market and picking out dinner. Read more about this phenomenon on our blog post about jubilees. If you need further info, have questions or would like to schedule a viewing for any of the homes for sale in Moloki Village or any other properties in the area, please email info@condoinvestment.com or call (251) Area-Pro (251-273-2776) for immediate assistance.